WASHINGTON, March 17 (Xinhua) -- Major Asia-Pacific countries have showed a "strong interest" in pushing forward regional economic integration in Chile, a top U.S. trade expert told Xinhua, even though U.S. government turned back from it. "I think the meeting in Chile was very constructive," said Jeffrey Schott, a senior fellow working on international trade policy and economic sanctions at Peterson Institute for International Economics, a think-tank based in Washington D.C. on Thursday. "It has brought together many countries of the pacific region that have a stake in deepening economic integration and a strong interest in finding ways to move that process forward," said Schott, who has been a member of the Trade and Environment Policy Advisory Committee of the U.S. government since 2003. 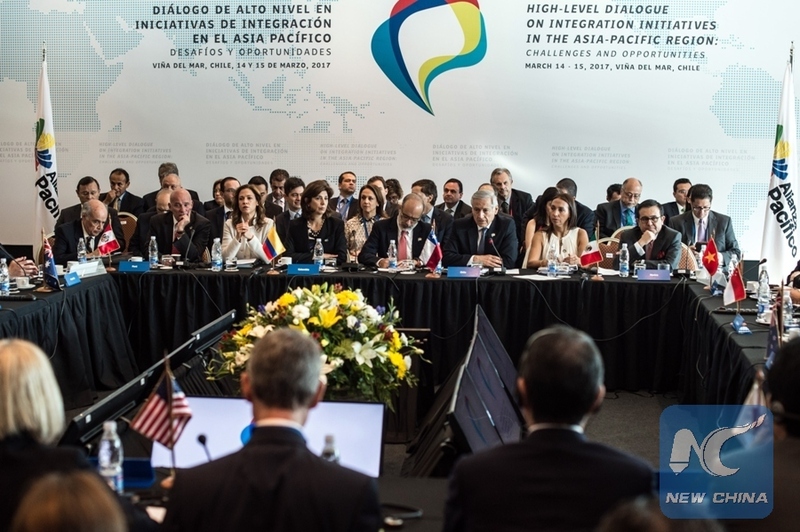 From Tuesday to Wednesday, Chile hosted a high-level dialogue meeting on integration initiatives in the Asia-Pacific joined by fifteen countries in the region including eleven remaining Trans-Pacific Partnership (TPP) member countries, United States, China, South Korea and Colombia. "It is very constructive for Chinese officials to participate in these talks," said Schott, adding "China has been at the center of discussions of many regional economic integrations for many years." Schott believed discussions in Chile had achieved concrete results saying "they have confirmed the process of consultation will continue in May on the sideline of the Asia-Pacific Economic Cooperation (APEC) trade ministers meeting in Vietnam." "There was a general recognition of the importance of sustaining many of the innovative results that have come out in the recent trade negotiations," added Schott. Chile meeting is the first meeting of TPP members after the U.S. President Donald Trump withdrew the United States from it in January which was believed to have the treaty knocked down. TPP was signed by its members in February 2016. It was one of the largest regional free trade agreements in Asia-Pacific region which encompassed 40 percent of the world economy. But Schott said, according to the information he gathered from the meeting in Chile, the remaining TPP members will not give up the agreement because they don't want to forego many of the benefits that would accrue to them from substantial trade and investment reforms that were promised by the TPP. "They are looking for a way forward. That sustains many of the accomplishments of TPP, but perhaps provides a different channel for participation by many countries in the region and hopefully in the future by the United States as well," said Schott. Schott said the United States will not actively return to the regional trade talks in a near future because that's not their priority. "They (U.S. government) have said very clearly they want to start with bilateral negotiations with Mexico and Canada, and also with Japan and South Korea," he said. Schott believed U.S. retreat from regional talks would make the Asia Pacific region enter an area "where letting a thousand flowers bloom may be an appropriate approach for trade negotiations." "Many of the TPP signatories value the trade relationship with China and want to deepen those trade ties as part of a broad process of regional economic integration," said Schott. "Either by launching new negotiations of bilateral trade agreement which I think Canada for example is interested in doing with China or by upgrading existing agreement that countries already have with China," added Schott. As the largest economy in TPP after the United States leave, Japan will also be "very interested" in talks promoting Asia-Pacific economic integration in the future as well as a bilateral trade discussion with the United States because Japan has strong commercial and security interests in maintaining strong ties with the United States, said Schott. "Those two are not mutually exclusive. The Japanese will also continue to work and participate in the Regional Comprehensive Economic Partnership (RCEP) negotiations," he added. Schott also believed the United States will not make a better deal with Japan on bilateral basis than TPP because TPP has opened other Asia-Pacific countries' markets for Japan, which allured Japanese to make more concessions. "They (U.S. government) will find that there is greater benefit to accrue to U.S. interest by pursuing a regional approach," said the veteran in international trade negotiations, who was a member of the U.S. delegation during the Tokyo Round of multilateral trade negotiation in 1970s. Talking about the future of Asia-Pacific economic integration Schott said China will continue to play an important role. "Moving forward on a Free Trade Area of the Asia-Pacific (FTAAP) was one of major accomplishments of the Chinese chairmanship of the APEC two years ago," Schott said. "The impression I've got is Chinese officials have been very pragmatic and see great value in deepening their trade ties with important partners of the region and welcome the opportunity to discuss further trade relations with those countries." Schott also said current RECP is not a "viable pathway" for Asia-Pacific economic integration, but raising its free trade standards through future talks may lead to a different scenario. The RCEP is a proposed regional free trade agreement between the ten member states of the Association of Southeast Asian Nations (ASEAN) and six countries including Australia, China, India, Japan,South Korea and New Zealand. "If the talks continue and the content of the (RCEP) agreement is significantly improved, then one could change the assessment," said Schott. "Many of the TPP signatories will participate in the RCEP negotiation and hopefully to try to improve the quality of the agreement," he added.